You can see these and other 29 cartoons in full-size on the new Non-Stick Looney Disc! 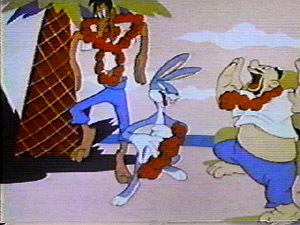 The following cartoons require Real Player 5.0 or higher and a 56kbps internet connection or higher. Do not attempt to play these at a slower speed, they will not work correctly. 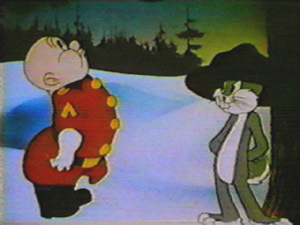 In this classic cartoon, Elmer Fudd introduces two marvelous shorts one starring Bugs Bunny, and Porky Pig. The other is called "Blue Danube" featuring a family of swans who get a few visits from a couple of other birds. 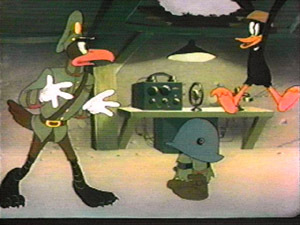 In this WWII cartoon Daffy gives the Nazi's something to worry about. One crazy gag after the other keeps them on their toes. Bugs meets his match in 1943 when he discovers that there are such things as gremlins. 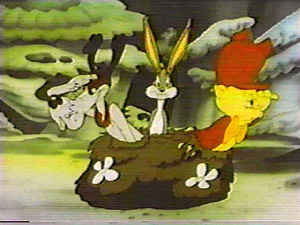 This cartoon is a rollercoaster ride as Bugs and the Gremlin spar with eachother for controll of a WWII Bomber. Elmer is a Candian mounty determined to get his man, or Rabbit in this case. 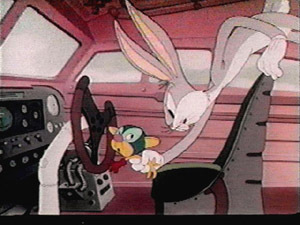 Bugs shows Elmer that bringing him to justice might not be as easy as he planned. Two unsuspecting ship-wrecked castaways find themselves famished, and on a deserted island where the only thing to eat is Rabbit. But as they discover, hunger is prefered to the agony that Bugs can inflict.